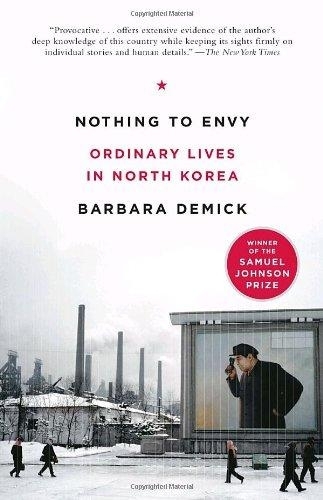 On Monday I finished Barbara Demick's Nothing to Envy: Ordinary Lives in North Korea, and I highly recommend the book. Unlike the previous book I read, The Impossible State: North Korea, Past and Future, Demick's novel is a much faster read, as if it were fiction. But make no mistake, this book is non-fiction. It follows six North Koreans beginning at their childhood, through their escape, to their current life in South Korea. It was agonizing at times to read and know I am so close to this country, but can't help directly. How I wanted to share my meals with the people starving in the north, or teach English to defectors in South Korea. One of the women interviewed for this book lives in Suwon, which is just an hour and a half southwest of my city (by bus). I'd feel anxious and charged while reading, knowing that these people were so close. I very well could have passed a North Korean in Seoul, and never would have known. This book shows not just the problems (that term is an understatement) with life inside North Korea, but also the difficulties that defectors face while transitioning to life in South Korea. If you're looking for something to read, I highly recommend checking this one out from your local library.